Visors! Perms! Flash Mob at the Korean Market! The ladies of Ajumma EXP crash the produce aisle in celebration of Korean American Day. Ajumma EXP strikes back! This is how you celebrate Korean American Day. If you didn't know, January 13 was Korean American Day, commemorating the arrival of the first Korean immigrants to the United States in 1903. And if you were shopping at Zion Market in San Diego on Saturday, you may have seen a badass flash mob of ajummas getting their commemoration on. Hard. Ajumma EXP describe themselves as "a crew of fierce women who embrace growing older, getting wiser, and being able to laugh at ourselves." 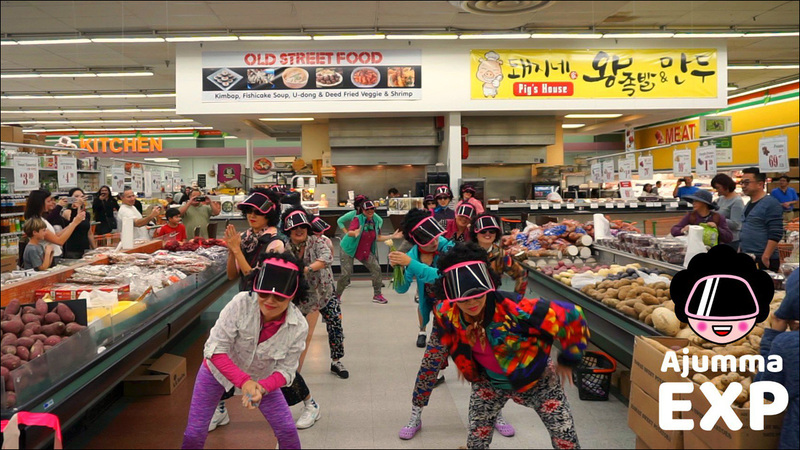 Following their stunning debut last fall at the San Diego Asian Film Festival, the ladies of Ajumma EXP recently brought their visor-clad fierceness to the food court and produce section at the local Korean market, busting a move to J.J. Fad's "Supersonic." It was glorious. The folks at Zion Market were not ready for this awesomeness. If you'd like join the Ajumma EXP movement, grab your visor, get that perm tight, and learn more at AjummaEXP.com.